In the category of “it’s a good problem to have,” would fit both attempting to see every intriguing new product at InfoComm 2018– one of the best InfoComm’s in years for new technology (and that’s a high bar)– and the task of selecting the winners of this year’s Digital Signage Best of Show at InfoComm 2018. The show continues tomorrow, Friday, and we’ll all need that extra day to take it all in. But the winners of the Digital Signage Best of Show are here announced, after an on-site curation process on the show floor Wednesday and Thursday. And the winners represent a great crop of new-gen technology in everything from large palette direct view LED to AV over IP. From fine pitch LED from Sony, Silicon Core, Christie and Absen, to transparent LED from LG, to projectors as effects and video lighting from Epson– to highlight just a few. The HYPERVSN system is an integrated 3D Holographic visual solution that allows hi-resolution 3D videos and images to float in mid- air without the need for glasses or any other additional user equipment. • LG Electronics, Inc, LG Transparent Color LED Film LAT240DT1. The LG Transparent Color LED Film (model LAT240DT1) offers digital content and information while interacting seamlessly with its surrounding environment. The versatile LED Film offers over 1,000 nits brightness that truly brings content and information to life like never before, all while maintaining a high transparency. At just 1.5mm thin, the 24mm Pixel Pitch display can be installed on any existing glass surface using its self-adhesive transparent film, offering system integrators a seamless installation option that does not require additional construction and therefore saving both the end user and integrator time and money. The size and layout of the film can be redesigned in many ways, expanded by adding more films vertically or horizontally, or cut in parallel with the bezel to meet size requirements, all while taking up no additional real estate, especially beneficial in crowded retail environments. The flexible display also works on curved surfaces truly converting any area of ordinary glass into state-of-the-art, colorful digital signage capable of portraying dynamic content. As a result, the LG Transparent Color LED Film is ideal for indoor and window-facing areas with large glass surfaces such as retail storefront windows. Other applications include mass transit rail platforms and safety barriers, where it can display digital content and information, and lobbies and large public areas where the film can convert ordinary glass into stunning, eye-catching digital signage displays. Even tall glass elevator shafts can be transformed into pillars of graphics and light. First shown in the U.S. at DSE a few months ago, LightScene is a new category of accent lighting laser projectors from Epson for digital art, spatial design and signage. Simultaneously illuminating and projecting experiential content on virtually any surface or material, LightScene is designed to engage audiences and provide an immersive experience with dynamic content for commercial signage applications in markets such as retail, hospitality, showrooms, and museums. 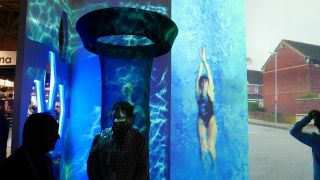 From visual merchandising to spatial design, LightScene can be used for an array of uses with the goal of transforming spaces and captivating customers, such as showing real-time information about drinks and special offers on bar tops; creating retail displays such as a water immersive visual displayed over a swimsuit; or an immersive projection of running trails onto the surrounding surfaces near a treadmill, web-based application or over the network with Crestron, Art-Net and more. Samsung’s ‘The Wall Professional’ is a modular, large-format indoor MicroLED display that can extend to hundreds of inches in size while delivering outstanding brightness, contrast and viewing angles. This display is business-ready and its modular design allows for customized configurations beyond or below its 146-inch size standard. Users can add or remove unlimited LED screens to and from The Wall Professional without impacting performance or presentation quality. The display’s self-emitting MicroLED pixel modules produce brilliant imagery free of color filters or backlighting and envelop viewers through elevated peak brightness and a near infinite contrast ratio. • Absen LED. The Acclaim Series provides the perfect indoor direct-view LED solution for today’s markets such as retail, corporate, transportation hubs and houses of worship thanks to its wide range of pixel-pitch configurations; 1.2mm, 1.5mm, 1.9mm, 2.5mm and 3.8mm. Acclaim’s HD aspect ratio and 27.5” diagonal size allows four panels to create a 55” display like that of a LCD, but without mullions. The four panels can be installed with a standard VESA mount and allows the end user to work in a standard 16:9 aspect ratio. Installation of the series is fast and easy whether it’s mounted to a wall, hung or free-standing. Acclaim comes with an Easy Mount Kit that has a thickness of no more than 4 inches allowing for ADA compliant installations. Each front or rear installed panel is interchangeable left to right and are held in place by 4 corner magnets. The series offers creative flexibility and can be customized to provide up to 90-degree convex or concave curves and angles. Acclaim is built to last with an LED life of 100,000 operating hours and is designed for easy serviceability and repair with universal magnetic modules that lock into place with guided grooves that prevent potential bending or torqueing of the panels. Christie Velvet CorePlus, are available in a range of pixel pitches, these full-featured, high-value video walls are ideal for fixed installation and digital signage applications. With a host of options found in more expensive LED products, CorePlus has been designed with a focus on affordability and flexibility. The choice of on-board or remote power increases installation options while providing efficient heat management and built-in redundancies. Fully serviceable from both the front and rear, CorePlus is easy to install and maintain. For added flexibility, CorePlus is compatible with our ADA-compliant direct-mount system, allowing it to be installed directly on to appropriate surfaces, eliminating the need for a costly mounting frame. Like all Christie LED, it’s backed by industry-leading warranties, support and leasing programs – giving you the ultimate peace of mind. NEC’s C751Q boasts 350-500 cd/m2 brightness along with an anti-glare screen and ultra-high definition panel in a brand new robust but aesthetically focused design. Equipped with 3 separate HDMI 2.0/HDCP 2.2 connections on each display, UHD/60 support is possible through a single cable with the HDCP support through 3 separate inputs if necessary. Additionally, the large format display allows for audio, video or image playback via USB or SD card that is also updateable via LAN. The C751Q is ideal for 24/7 digital signage in retail, education, entertainment and informational environments and will be available for purchase June of 2018. Sharp is announcing at InfoComm 2018 an expansion of its smart signage solution that provides greater brightness and is engineered for 24/7 around-the-clock usage. The new 40" Class (39.5" diagonal) PN-M401 and 50" Class (49.5" diagonal) PN-M501 professional LCD monitors deliver out-of-the-box digital signage solutions, even without external devices such as PCs. The PN-M displays offer mounting flexibility and can be installed in landscape or portrait orientation, face-up, face-down, tilted forward or backward at an angle of up to 90 degrees. Each PN-M series display features a powerful built-in SoC (System on a Chip) controller driven by the Arm Cortex-A17 quad core processor (max. 1.8 GHz) with 2 GB memory and 8 GB storage, and integrates Android OS for third-party Android platform apps. The PN-M401 and PN-M501 feature excellent image quality and are designed for flexibility in a variety of settings. By creating monitors that are 50% brighter than the PN-B series, the displays allow for 24/7 usage rather than 16/7. Content can be displayed on the PN-M monitors in a number of simple ways. For example, users can display web-based digitalsignage content by entering a URL in the embedded HTML5 Browser and they can route videos and still images through the pre-installed media player. For more advanced applications, users can port their Android-based application to run on the PN-M Series’ embedded SoC. Sony expanded its professional BRAVIA line with six new 4K displays, for professional digital signage, information and monitoring applications, as well as use in meeting rooms, classrooms, lobbies, hotel guest rooms, showrooms, sports venues and more. These new models offer professionals connectivity and flexibility in a range of sizes and price points. The six BZ35F models range in screen sizes from 43 to 85 inches. Based on the display technology in Sony’s consumer TVs, the new series adds professional features like network and serial communication control, flexible installation options and high brightness. The series’ “Professional Mode” allows users to customize display settings easily for different for signage or meeting room applications. Users can also export and import settings to and from USB flash memory. Users can install many of the new models in vertical, tilt or table-top configurations, and the 55-, 65- and 75-inch modes also include an optional touch panel overlay for interactive whiteboard use and annotation. The 1.2mm direct view LED product is available in a durable design for high foot traffic applications. Available in a 1.2mm display with 1200 nits along with its patented HDR driver technology for remarkable image performance. New Tetra Pixel design for a more advanced and robust solution. It comes in a 500x500mm footprint and front service for flexibility in building a digital canvas to the customer’s size requirements. Ideal for digital signage applications requiring durability such as retail, or DOOH, transportation and entertainment as well as multiple use for exhibit design, retail pop ups, event and rental. With the patented Common Cathode technology, SiliconCore displays boast the lowest power consumption numbers in the industry along with the highest performance displays, designed to protect your investment and provide the best overall total cost ofownership. The VeCASTER PRO 4K H264 is a single channel UHD HDMI2.0 video to H.264 professional IPTV video encoder with MPEG1 Layer2 and AAC selectable audio. Distribute any 4K UHD HDMI video directly to an unlimited number of 4K SMART TVs, smart phones, tablets, computers, IPTV Boxes, over LAN or WiFi. A built-in 1 Gigabit hardware full-speed server with the capability to serve hundreds of TVs and video players, without the use of additional parts, makes the solutions ideal for the average internet speed available today in most homes in the US. Barco UniSee takes a completely new approach to truly seamless LCD video walls. Redesigning and optimizing every component, Barco UniSee is not only a step forward in terms of image quality, but also in installation time, ease-of-servicing, and reliability. There are three key differentiators with Baro UniSee that sets it apart from other video walls. NoGap technology, which makes the inter-tile gap barely noticeable, finally makes it possible to spread content over multiple tiles without the interruption of a disturbing bezel. In order to guarantee the smallest possible gap without damaging the panels' edges, Barco has created the UniSee Mount. This revolutionary mounting structure uses the power of gravity to perfectly and automatically align panels – and keep them in place over time. What's more, UniSee Mount also eases setup and maintenance efforts, allowing swift undocking of separate panels. Sense X, the automatic, continuous and real-time color and brightness calibration system, ensures that the complete wall gives a perfectly balanced image at all times. What’s more, Barco has also re-engineered the design of the panels to counter all possible variations in brightness from the center to the edges. Colors remain uniform and bright over time. • tvONE, The HDMI 4-port output module for CORIOmaster provides the 4RU C3-540 CORIOmaster video wall processor with up to 56 outputs, allowing for bigger, better displays. The CORIOmaster family, which includes the 4RU C3-540 CORIOmaster, the 1RU C3-510 CORIOmaster mini and the ½ RU C3-503 CORIOmaster micro, are modular 4K video processors with high-quality CORIO scaling. Mixed input resolutions, pixel-perfect window placement, source and screen orientations, bezel adjustment, edge-blending and customizable output resolutions contribute to CORIOmaster being the most flexible video wall processor solution available. This allows designers to achieve the most striking visual effects possible. CORIOmaster systems also feature streaming media and 4K playback modules, which allow digital video from the cloud or the internet to be blended with local media and AV connections and presented together on a video wall in any configuration. Engineered in the Crestron DigitalMedia Lab, DM-NVX is the only secure network AV solution that now supports Dante and AES67. Crestron’s exclusive, patent-pending technology eliminates the latency associated with network video. DM-NVX provides a high performance, real-time AV encoder or decoder that transports 4K60 4:4:4 video over standard Gigabit Ethernet and enables fully-scalable, enterprise-wide 4K content distribution. DM-NVX employs advanced security features and protocols, delivering a true enterprise-grade solution that easily fulfill demanding IT policies. DigitalMedia NVX technology transports ultra-high definition 4K60 and 4:4:4: video over standard Gigabit Ethernet. Support for HDR video (HDR10) and HDCP 2.2 ensures the ultimate in picture quality and compatibility for all of today's varied media sources. Using standards-based Ethernet wiring and switches, DM® NVX delivers an infinitely scalable, high-performance solution for enterprise-wide 4K content distribution. DM-NVX employs advanced security features and protocols, it delivers a true enterprise-grade solution that fulfills the demanding IT policies of corporate, university, medical, military, and government clients. The Crestron DM-NVX-352 is a compact video encoder/decoder designed to function as either a transmitter or receiver with the ability to switch between the two modes programmatically via commands from a Crestron control system. Featuring simple browser-based control, configuration, and management, USB 2.0 for cameras, microphones, whiteboards, and KVM routing, and support for copper and fiber LAN connectivity, DM-NVX-352 offers a one-stop solution for any-sized network AV installation. • Crestron Electronics Inc. The AirMedia Presentation System 300 (AM-300) enables secure wired and wireless presentation in lounges, lobbies, and open spaces, and integrates with popular calendaring platforms. It is ideal for organizations with a dispersed workforce, open floor plans, and reliance on mobile devices to present. It is secure, easy to deploy and manage, increases workflow, and facilitates collaboration by turning underutilized spaces into productive meeting spaces while supporting the many different platforms and services employees and guests have on their personal devices. The AM-300 device mounts invisibly behind a wall mount display and enables wired or wireless presentation with auto-switching. It features built-in AirMedia 2.0 wireless presentation capability, plus HDMI and DM inputs, HDMI out to the display (HD or UHD), and auto-on/off display control via CEC, serial, or IR. Connecting any source selects that input automatically and instantly displays the source image on the display. There's no programming required, no dongles to plug in, and no remotes to lose or batteries to replace..
• Peerless-AVPeerless-AV Xtreme High Bright Outdoor Display. Featuring an IP68 rating and a patented Dynamic Thermal Transfer system that allows the display to operate in extreme temperatures ranging from -31°F to 140°F, Peerless-AV’s Xtreme High Bright Outdoor Display is ideal for any digital signageapplication, including theme parks, transportation, sporting venues, retail, education, hospitality, and more. The Impact On-Wall Kiosk brings a new level of flexibility to the digital signage enclosure market while maintaining a sleek aesthetic to complement a variety of environments. A depth-adjustable exterior frame (3-5 inches) accommodates a variety of display depths. The kiosk can support displays up to 2.75” deep while keeping the exterior frame under 4” to meet ADA requirements. Reversible hinges help to avoid installation and service obstructions, and the exclusive design keeps the display mounted to the frame when opened, providing unparalleled service and maintenance access. Integrated wall reveal compensates for uneven walls to keep the frame plumb. Integrated engagement latches can be secured with tamperproof hardware to protect equipment. This kiosk is the first co-developed solution with Chief and Middle Atlantic, who were able to leverage the strengths of both brands. Components can be mounted on-wall utilizing the integrated Lever Lock™ system from Middle Atlantic, or in-wall with Chief’s accessory storage boxes. Hidden louvers provide passive ventilation, with optional upgrade paths for active cooling. The Gefen Gen 2.0 AV Over IP line, consisting of six sender and six receiver units, provides expandable and secure AV routing and distribution over a standard Gigabit Local Area Network. The new KVM, AV, and audio products offer an expanded array of input and output formats – including Display Port and audio-only – plus improved performance and enhanced functionality such as 4K Ultra HD with HDR support, built-in scalers, video-wall control, independent USB, RS- 232, IR, audio routing, and backward-compatibility with first-generation products. Key enhancements in the new line provide integrators with in-demand solutions, including a new Keyboard Mouse Emulation feature which facilitates real-time, simultaneous keyboard and mouse control of each source from all connected workstations, eliminating the inherent limitations of earlier systems. To simplify installation and placement, the sender and receiver units are powered through a standard PoE-enabled IP network switch. System configuration is fast and automated when used in conjunction with the Gefen EXT-CU-LAN Matrix Controller. Its Mass-Firmware-Update (MFU) feature keeps the entire system up-to-date without the need to access and upgrade each unit separately. XhibitSignage is a content-rich, cloud-based digital signage software developed by Mvix, a VA-based digital signage solutions provider. It enables users to remotely manage, update and display dynamic content on digital signs, video walls, and interactive displays and kiosks. The cloud-based software can be accessed from a standard web browser i.e. www.xhibitsignage.com. This enables both remote management and centralized control of the digital signage network. XhibitSignage users have two options for building their digital signage systems. The first is using the software with the Mvix line of Xhibit digital signage players. When using Mvix players, the software is free i.e. there are no licensing or subscription fees. This option includes a licensing fee that’s billed annually. The CDE8600 from ViewSonic is an 86-inch, 4K Ultra HD commercial display that delivers a powerful viewing experience. With native 4K (3840x2160) resolution, 400-nits of brightness and wide viewing angles, the ViewSonic® CDE8600 can engage the viewer with images that are vibrant and brilliant, and with an 85.6-inch viewable screen, provide a larger than life experience. The ViewSonic CDE8600 comes with an embedded Android SOC that allows users to install Android apps for rich content broadcasting, while a built-in browser displays internet content without the need for a PC. The CDE8600 includes a powerful multi-core media player that allows photo, music and video playback, while 16GB of internal storage provides capacity for files and multimedia content. The CDE8600 is also bundled with ViewBoard Cast, Zoom® video conference and vController software. ViewBoard Cast enables content to be streamed from mobile devices onto the display over wireless or cable networks. The vController software offers easy maintenance and intuitive interfaces for remote management through a PC server or laptop. The CDE8600 provides easy network connection options for content streaming with an integrated RJ45 connection, as well as optional Wi-Fi capabilities. With a variety of connectivity options, including HDMI, DisplayPort, VGA, USB, IR and RJ45, the CDE8600 also features dual 20W speakers to deliver an immersive, high-impact messaging solution in just about any environment. The ViewSonic CDE8600 4K Ultra HD commercial display delivers high reliability at a great value, 16 hours a day, 7 days a week. Equipped with Intel’s Open Pluggable Specification (OPS) and Intel’s Smart Display Module (SDM), the CDE88600 offers cable-free integration and easy installation in any environment.